This is an archived article, which may no longer reflect the current situation, but has been kept online for reference purposes. Viewers in York have got a better chance of receiving their forthcoming new local TV channel for the City, after Ofcom approved a new transmitter site. Originally, local channel Hello York was due to broadcast on Freeview from the transmitter at Bilsdale West Moor, to the north of the city. It's the transmitter from where the Tyne Tees version of ITV is broadcast from. Despite its proximity to York, most viewers in the area choose to receive their Freeview TV service from the more distant Emley Moor transmitter in West Yorkshire, which carries Yorkshire regional TV news. This would have meant that most viewers in the York area would have aerials pointing towards the wrong transmitter for the local TV service. Now, Ofcom has published details of a new transmitter site that was initially approved last month. 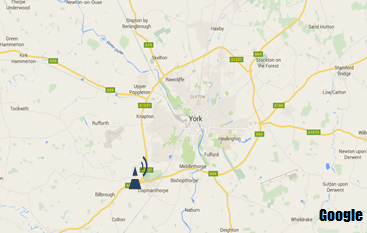 Hello York will now broadcast from the Askham Bryan water tower, just off the south-western tip of York's ring road, replacing Bilsdale. Askham Bryan was originally used for York's short-lived analogue channel York@54. In approving the new site. Ofcom said that the new transmitter location would improve Hello York's viability as more households would be able to tune in. Its position to the south-west of York means that everyone in York with an aerial pointing south-westwards to Emley Moor for all of the main Freeview channels should also be able to receive Hello York when it launches on Freeview. It will broadcast on UHF channel 24 and the transmitter will beam its signal in a north-easterly arc across the City. The transmitter-related delay means Hello York has been given until next July to launch, when the new transmitter should be ready. Ofcom has also confirmed that the new local TV channel for Basingstoke will commence broadcasting next summer on the new frequency of UHF channel 51. Earlier this week, a516digital reported that the local TV licence holder for Basingstoke (That's Media) and local TV multiplex operator Comux had requested changes to the original allocation in order to improve coverage and reception. Is the Askham Bryan transmitter in addition to the one at Bilsdale or instead of it? If it's the latter then I suspect that I might miss out on this new channel as my aerial points to Bilsdale. Askham Bryan is the new (and only) transmitter for York local TV.